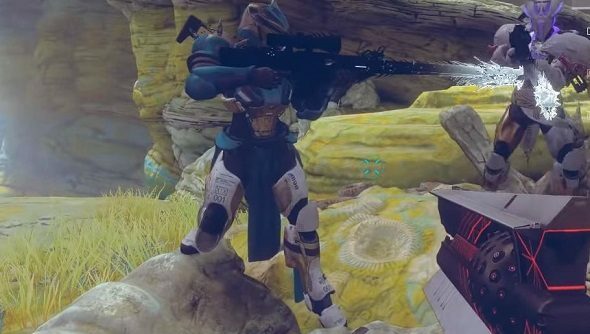 Destiny 2 players have uncovered a secret quest, and it yields an exotic sniper rifle that’s a callback to the original Destiny’s Black Spindle. Here’s how to find the quest, and some guidance on what you’re up against once you’ve triggered it. The hidden quest is called The Whisper, and it involves a mad dash through some of the toughest platforming and Taken fighting seen in Destiny 2 to date. But if you’re successful, you’ll earn the Whisper of the Worm, an exotic sniper rifle that harkens back to Destiny’s Black Spindle. The Whisper of the Worm has an updated look, but comes with the same key perk as Black Spindle. It’s called White Nail, and it automatically reloads the rifle’s magazine if you score critical hits with all three shots. Here’s our list of the best FPS games on PC. To access the quest, head to the Io patrol zone and make for the Lost Oasis area. Once you’re there, you’ll have to wait for an infrequent public event to start, called Taken Blight. Look for a cave high above on the cliff that opens toward the Pyramidion. When the Blight event begins, head into the cave to find a Taken mini-boss called Urzok, Aspect of Hate. He’s tough, so bring your fireteam and unleash your supers on him. When he’s down, head back out of the cave and look for a new portal that’s opened up on a flat-topped rock formation (it should be easy to spot between you and the Pyramidion). Head into the portal, and the secret quest The Whisper begins. This is where things get hairy. First of all, you’ve got a hard cap of 20 minutes to complete this mission, and it won’t be easy. You’ve got to race through The Grove of Ulan-Tan, a lost sector which comprises a maze of tunnels, platforming challenges, and finally several chambers full of bosses. Ignore enemies as much as possible as you head through the tunnels, and take a right at the blue light. When you see a room with an objective marker over a pile of Vex blocks, stay straight. You’ll find a tunnel to a room that opens on two Vex blocks, and here you’ll want to bear to the right toward the chest. This tunnel will open over a large chamber, but jump to the left and into another tunnel, where you’ll find a small Taken blight. Destroy it, and jump into the tunnel beneath it. This is some very tricky jumping, and it involves crossing impossible-looking spans and increasingly narrow ledges while avoiding things that want to throw you into the abyss or pound you into Guardian jelly. You’ll have as many respawns as you need, but bear in mind you’ve only got 20 minutes to make it through the entire sector before the anomaly collapses. Once you’ve cleared the platforming area, you’ll face a series of arena battles. Be sure to take out the Taken’s blight orbs as they pop up in order to keep minions from spawning in. These are tough battles, and you’ll want to have the majority of your time remaining in order to handle them. The final chamber will have your fireteam squaring off against multiple Taken bosses at once. It’s a big arena, and you’ll have to scramble to get behind what cover is available. There are some small caves that you can duck into and loop around to another opening; use these to recharge your shields and reload. If you’re able to blast your way through the fight, you’ll be dumped back out into Io with your brand new Exotic sniper rifle, Whisper of the Worm.